Lima, Peru -- The 2010 winner of the Nobel Prize for Literature, Mario Vargas Llosa, joined his former classmate Architect Luis Huarcaya, Past-President of the Universal Peace Federation of Peru (2008-09) and other distinguished colleagues at a special ceremony held in the Military College "Leoncio Prado" in Lima, Peru last month. In the Rafael Hoyos Rubio military barracks, currently the temporary headquarters of the Leoncio Prado Military Academy (made famous by the celebrated book La ciudad y los perros), the distinguished Nobel Laureate Mario Vargas received a Peruvian military decoration in recognition of his distinguished career. There were two meetings and two speeches by the laureate, one in the courtyard of honor of the College, and the other in the hall of homage of the military barracks. The first, in front of the cadets and military top brass of Peru, was attended by former students of the seventh promotion "Los Perros" including the former government ministers General Marciano Rengifo and Architect Luis Huarcaya together with representatives from other promotions of the College. ALMA MATER. Mario Vargas Llosa was distinguished by Leoncio Prado College (immortalized in the book The City and the Dogs). Tribute to the cadet of world literature. "We are all Jaguars." Victor Flores and Luis Huarcaya reminded everyone of this phrase and, despite the elegant suits, the advanced years and the gray hairs, they once again became the cadets who in 1950 lived in the classrooms of the Colegio Militar Leoncio Prado. Flores and Huarcaya were classmates and Cadet Corps colleagues of Vargas Llosa; the three are part of the seventh promotion of the military academy, and met again yesterday in the institution which saw them start to develop as young men, during the ceremony offered to the Nobel prize-winner. "Mario Vargas Llosa wore the same blue uniform as you, cadets." As he spoke, the head of the school, Colonel E.P. David Ojeda, talked without any hesitation during his speech of homage. It seemed that with the strength of his words he wanted the cadets to share a little of the greatness of Vargas Llosa. The author listened happily as the ceremony started with Carlos Tufino, cadet of the fifth year, reciting a poem created in his honor. "Here is a cadet at the start of his life, before launching his pen to the world," he said. And Vargas Llosa did not cease to applaud as he listened to Tufino speak of the Jaguar, the Poet, and The City and the Dogs -- the novel and the college that the writer made eternally famous. Consigned to the past was the story of when the military dictatorship gave the order to burn The City and the Dogs, claiming that it denigrated the glorious Colegio Militar Leoncio Prado. Now, today, the college is grateful for the writer's existence. The Nobel prize-winner for Literature also gave an emotional speech in which he made great efforts not to break down. "Follow your dreams, cadets. Choose your future by calling from any vocation …. that can benefit Peru….and then fight for the future, to make this Peru greater you must give of yourselves," he counseled. 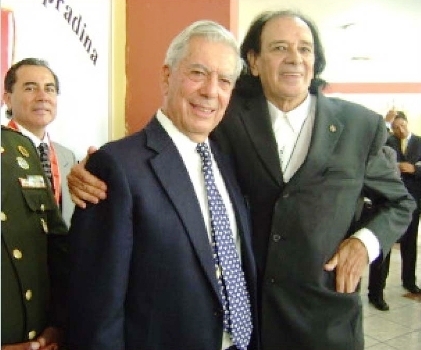 So, Mario Vargas Llosa was reunited with his friends from the promotion and shared with them a few minutes of nostalgia before melting into a fraternal embrace. Yesterday, they became once again 14-year-olds. Yesterday, Victor, Luis, and Mario became again "los Perros" of the 1950s.